Peaches and blueberries don't get any better than in the middle of summer. Combine these fresh ingredients in a pie for a perfect summer treat! View recipe here. Cold winters in New England are filled with anticipation of beautiful summers to come. 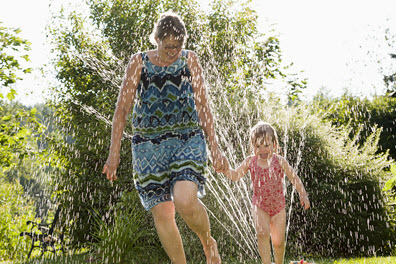 Make the most of your summer by keeping in mind these safety tips. Read more. Chelsea Groton Bank is Part of the CT Sub Trail! Chelsea Groton Bank is a sponsor of the CT Sub Trail, a public art project created in conjunction with Connecticut's Submarine Century, which is celebrating the 100th anniversary of the Naval Submarine Base. Designed by Sophie Heublein, a sophomore at St. Bernard High School, Chelsea Groton's sub sculpture is called "Nature vs. Machine" and is now on display outside of our Groton location at 904 Poquonnock Road. Download the app today for more info on each of the subs and their locations. Chelsea Groton Bank is a sponsor of this free, nautically-themed festival celebrating literature and the environment. Special guests and performers will arrive by tugboat. Community readers, live performances, hands-on activities, big boats, sea critter touch tanks and much more will entertain the whole family! Chelsea Groton Bank is sponsoring Hygienic Art Park's Summer Flicker series on Wednesdays in July (July 20 - The Sandlot, rated PG; and July 27 - Ferris Bueller's Day Off, rated PG-13). Attendance is free, but donations for the Hygienic are appreciated. Gates open at 8 p.m. for each of the screenings.